Prairie gardening with native North American wild flowers is part of the movement toward more sustainable gardening. Prairie landscapes are natural to Midwestern regions of North America, but today very little original prairie remains. The New England aster, golden rod, and other native plants and grasses are the fabric of an original Wisconsin ecosystem. These endangered prairie landscapes, adapt to our temperate climate, require less maintenance and watering. The longer roots of prairie plants provide improved, slow rate water infiltration. Insects and birds also flourish in this type of habitat. Prairies provide balance to our fragile environment, benefiting us all. 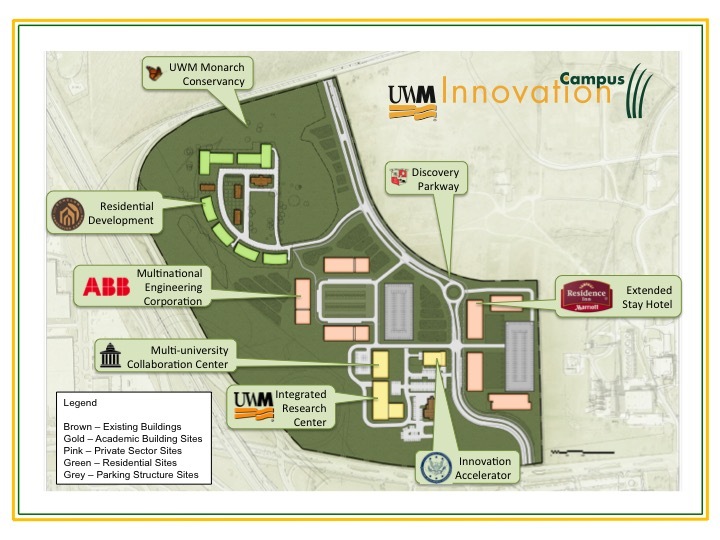 UWM Monarch Conservancy- As part of the UWM’s Innovation Campus development, 11 acres were set aside as prairie for a natural resting area, providing food and shelter for the large influxes of monarch butterflies. Architecture and Urban Planning Building– south and west faces- Wrapping the AUP building on two sides, this prairie was planted by the student organizationEcoTone. Downer Prairie– Located east of the Klotsche Pavilion, this is the largest prairie on campus. It is also the only prairie on campus that has been managed by regular burns. Lapham Prairie– Located near the southwest corner of Lapham, this prairie is managed by Tom Schuck of Biological Sciences.